What a difference a day makes! 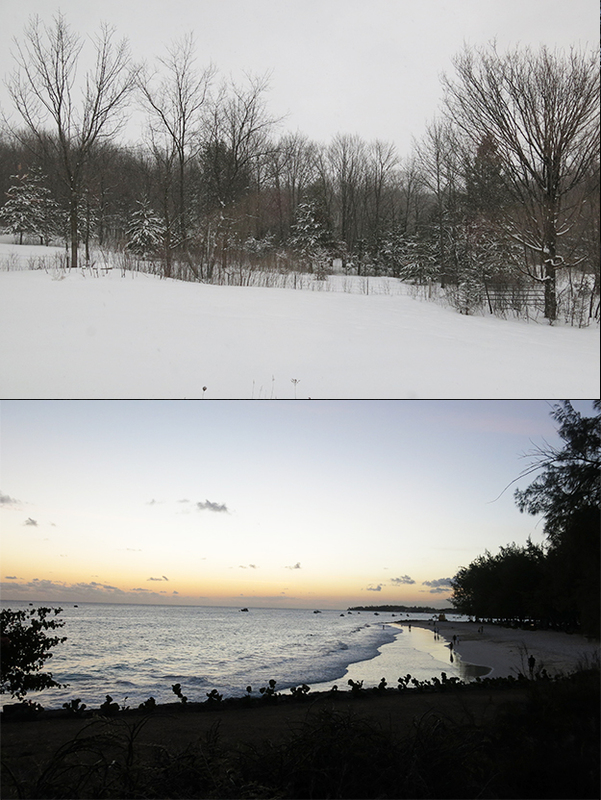 In just three times zones, well two with day light savings time in effect, we made our way from 14 degrees F and snow to 80 degrees and sunny. It's incredibly beautiful here. The people are warm, helpful, and great cooks. We're loving West Indian cuisine. The rich flavors and spices are steeped in tradition. Before I tell you all about the food and in particular, Macaroni Pie, I have to share at least one rum punch photo with you. This one was taken at Brown Sugar, a very traditional Bajan (that's what people from Barbados call themselves) restaurant. Here's some trivia for you. Punch is derived from the word Panch which means 5. There are five ingredients in Rum Punch; Sweet, Sour, Strong, Weak and Spice. One of sour, Two of Sweet, Three of Strong and Four of Weak. A Dash of Bitter and a Sprinkle of Spice served well chilled with plenty of ice. Mix together and pour over ice! 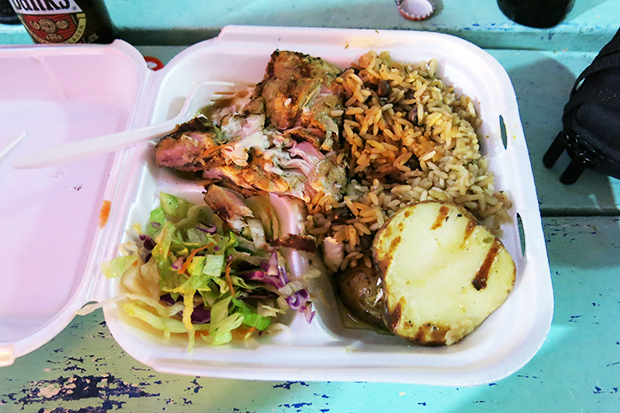 A typical Bajan meal is fried, grilled or blackened fish, macaroni pie or beans & peas, salad, and vegetables. Pass the Bajan hot sauce and you're all set. Root vegetables are really big, so I'm happy as can be. I have to tell you, I'm obsessed with macaroni pie. Not so much for for its taste or good looks, but for its wonderful tradition in the culture. Pie, as they call it, is everywhere, and is a staple in every household. Rose, a delightful sweet woman, is one of the maids at inn we're staying at. She's a grandma and knows her way around the kitchen. I asked her about her macaroni pie. She told me that no one really has a recipe, "they just make it, darlin". The manager of the hotel as well as the concierge joined the conversation. Each referring to an older family member who had passed down their recipe. "My mom adds mayonnaise", one said. "No mayo in ours, but we grate the onion and sweet pepper add just a bit of Bajan sauce for heat. ", another added. Some make it one the cooktop before putting it in the oven. Others stir it together after the macaroni is cooked but only bake it. I loved every second of the debate. Here's the meal at Brown Sugar. A piece of fried Flying Fish, macaroni pie and salad. The white sauce is a very smooth tartar sauce with Bajan sauce drizzled over the top for heat. The color is from Scotch Bonnet peppers. Bring on the heat! Preheat oven to 350 degrees F. Cook the macaroni in salted boiling water until tender, but not overcooked. Drain the macaroni and place in back in the hot pan. Mix in the butter. Add the cheese a little bit at a time. Whisk the egg in the milk then add to the mixture. Add the spices. Combine well and pour into an oven proof baking dish. Top with the butter, grated cheese and breadcrumbs. Bake 30-45 minutes until golden. The baking time will depend on the depth of the baking pan. So now that you've met macaroni pie & company, I'd like to tell you about the Oistins Market. Oistins is located at the South end of the island. It's a quiet end of the island with beautiful beaches and many more locals than tourists. As we walk past the post office and wooden shack (the bus terminal), we're greeted by a group of men sitting on buckets playing dominoes on the top of the steel oil drum. The banging sound and the laughter are heart warming as we pass. They look up with gentle smiles and always greet us hello. Our part of the island is Oistins, a fishing community. When the boats arrive back to shore with the fish, the fish go straight to the market. Next to the market is are several stands. My guess is about 30. Each one is about 10' square. Names like Roslin & Sons, Janet's, Uncle George's and Pats are painted on the wooden boards. Picnic tables line the streets and tiny alleys with a huge stage in the center of the market for music and dancing. A few stands are open daily. But, on Friday nights everyone goes to Oistins. Locals and tourists. Grab a Banks beer, find a seat and prepare yourself for the freshest fish around. Huge lights in the shape of fish hang over the main street. A chalkboard lists the fish for the day. We choose Uncle George's Fish Net this week. The stand is busy and lively. Reggae music plays loudly is the background, and the party had begun! The food is hot, fresh, not too fancy and always delicious. My meal was mahi mahi with rice & peas with salad. If you're traveling to Barbados and looking for some tips on where to stay and suggestions for restaurants here are my favorites. Little Arches Hotel - At the South end of the Island. A small cozy and lovely hotel. Travel safe, be safe and be kind.